Earnings improved 9% on strong asset growth and RIA-related results, as well as lower compensation costs. 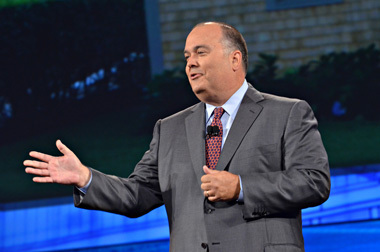 Chairman and CEO Mark Casady at a 2012 event. LPL Financial (LPLA) said its earnings grew 9.3% in the fourth quarter on higher advisory and brokerage assets, which improved 8.4% to $475.1 billion. Net income hit $48.5 million, or $0.49 a share, in the period ended Dec. 31, up from $44.4 million, or $0.43 a share, a year earlier. On an adjusted basis, earnings were $66 million, or $0.66 a share, vs. $65 million, or $0.63 a share, in the year-ago period, which beat analysts’ estimates. Revenue met expectations at $1.10 billion, a nearly 1% improvement from last year. These 2014 results included $18 billion in net new advisory assets for the year and $4 billion for the most-recent quarter, “benefiting in part from the strong growth in our hybrid RIA solution,” Casady explained. In addition, LPL added 363 net new advisors last year. The company says it now has 14,036 affiliated advisors, up about 3% from 13,673 last year. Of its total advisory and brokerage assets, nearly $176 billion, or 37% — are assets under custody vs. $152 billion a year ago. Assets under custody on LPL’s independent RIA platform jumped 44% year over year to almost $91 billion as of Dec. 31. These assets are managed by 322 independent RIA firms vs. 285 a year ago. Still, commission revenue dropped 5% year over year as sales of alternative products “returned to a normalized range relative to the elevated sales that occurred in the second half of 2013,” LPL says. Plus, the company’s sales of fixed annuities softened as interest rates stayed low. Recurring revenue, though, improved close to 5% in Q4’14. It now represents nearly 69% of net revenue and includes revenue from asset-based fees, advisory fees, trailing commissions, cash-sweep revenue and other advisor- and account-based fees. For the year, sales grew 6% to $4.4 billion, while core general and administrative expenses increased 5%, according to CFO Dan Arnold. “Adjusted earnings per share of $2.44 remained flat for the year as growth generated by our core business was offset by the headwinds from a decline in our cash sweep revenue and charges related to the resolution of regulatory matters,” Arnold said in a press release. Cash-sweep sales fell 7.2% year over year to $25.8 million in the fourth quarter, as insured cash account (or ICA) fees decreased by 7 basis points. In addition, LPL paid close to $5 million of regulatory charges in the fourth quarter. For the year, these expenses were $36.3 million, including fines and restitution. The firm says these charges “were approximately four times” the average level it paid in 2012 and 2013. In the third quarter of 2014, LPL’s net income dropped nearly 12% to $33.3 million, or $0.33 per share, in the period ending Sept. 30, from $37.6 million, or $0.36 per share, a year earlier; on an adjusted basis, net income fell 18% to $48.8 million, or $0.48 a share. During the period ended Sept. 31, the company paid $23 million in regulatory charges, which were $18 million above expectations and trimmed earnings by $0.11 per share. — Check out 12 Best & Worst Broker-Dealer 401(k) Plans: 2015 on ThinkAdvisor.